Peking Duck, or Peking Roast Duck is a famous duck dish from Beijing that has been prepared since the imperial era, and is now considered one of China's national foods. Left: Peking Duck sliced and prepared. The dish is prized for the thin, crispy skin, with authentic versions of the dish serving mostly the skin and little meat, sliced in front of the diners by the cook. Ducks bred specially for the dish are slaughtered after 65 days and seasoned before being roasted in a closed or hung oven. The meat is often eaten with pancakes, spring onions, and hoisin sauce or sweet bean sauce. A variant of the dish known as crispy aromatic duck has been created by the Chinese community in the United Kingdom. 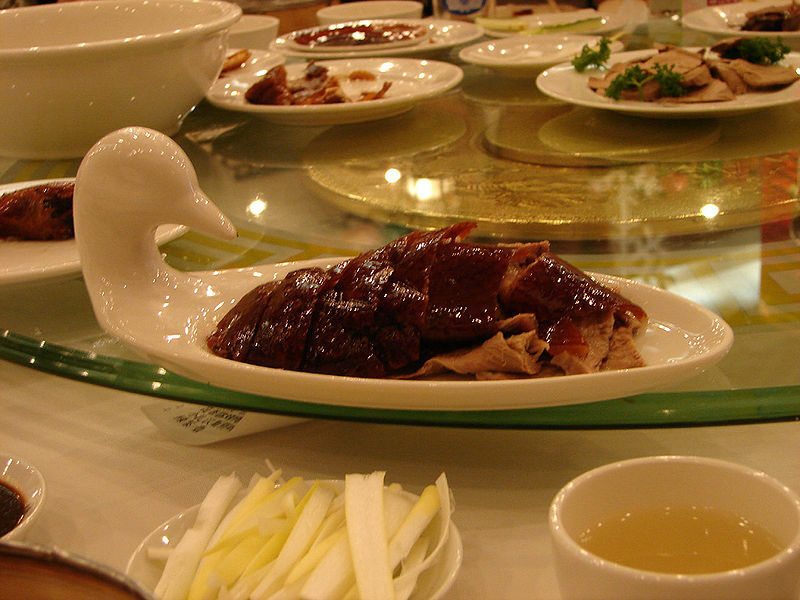 Peking Duck is prepared from the Pekin Duck (Anas platyrhynchos domestica). Newborn ducks are raised in a free range environment for the first 45 days of their lives, and force fed 4 times a day for the next 15–20 days, resulting in ducks that weigh 5–7 kg (11-15 Lbs). Fattened ducks are slaughtered, feathered, eviscerated and rinsed thoroughly with water. Air is pumped under the skin through the neck cavity to separate the skin from the fat. The duck is then soaked in boiling water for a short while before it is hung up to dry. While it is hung, the duck is glazed with a layer of maltose syrup, and the innards are rinsed once more with water. 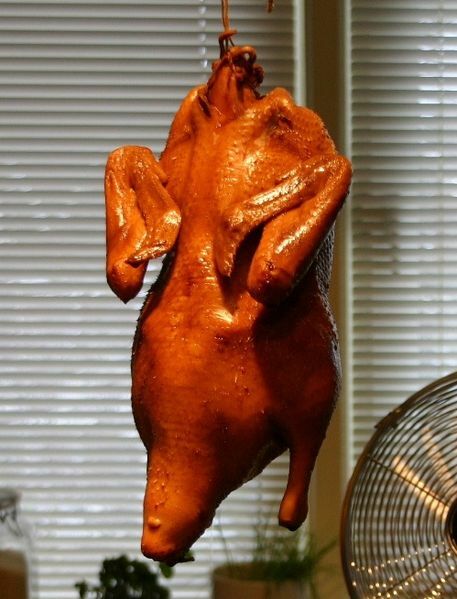 Having been left to stand for 24 hours, the duck is roasted in an oven until it turns shiny brown. Left: A Peking Duck after having been dried. Peking Duck is traditionally roasted in either a closed oven or hung oven. The closed oven is built of brick and fitted with metal griddles. The oven is preheated by burning Gaoliang wood at the base. The duck is placed in the oven immediately after the fire burns out, allowing the meat to be slowly cooked through the convection of heat within the oven. The hung oven was developed in the imperial kitchens during the Qing Dynasty and adopted by the Quanjude restaurant chain. It is designed to roast up to 20 ducks at the same time with an open fire fuelled by hardwood from peach or pear trees. The ducks are hung on hooks above the fire and roasted at a temperature of 270°C (525 °F) for 30–40 minutes. While the ducks are cooking, the chef may use a pole to dangle each duck closer to the fire for 30 second intervals. The cooked Peking Duck is traditionally carved in front of the diners and served in three stages. First, the skin is served dipped in sugar and garlic sauce. The meat is then served with steamed pancakes, scallions and sweet bean sauce. Several vegetable dishes are provided to accompany the meat, typically cucumber and carrot sticks. The diners spread sauce, and optionally sugar, over the pancake. The pancake is wrapped around the meat with the vegetables and eaten by hand. The remaining fat, meat and bones may be made into a broth. Otherwise, they are packed up to be taken home by the customers. Whole Peking Ducks can be ordered as takeaways. The ducks can be reheated at home with an oven, grill or boiling oil. When an oven is used, the duck is heated at a temperature of 150 °C (300 °F) for 20 minutes, and then at 160 °C (325 °F) for another 10 minutes. The grilling method involves filling the duck with boiling water before placing it on a griddle, 70 cm (28 in) above the cooking fire. The boiling water is replaced every 3–4 minutes until the duck's skin is piping hot. To reheat the Peking Duck with oil, the duck is sliced into thin pieces and placed in a strainer held over a wok of boiling oil. The duck is then rinsed several times with the oil.